Dogs Out Loud was awarded an enrichment grant from Animal Farm Foundation that we chose to use to support the dogs at our city shelter, Austin Animal Center. After working for several months to coordinate the project with the city, the components were installed at the shelter yesterday afternoon! We managed to complete the project and have our set-up day fall just as August and its heat advisories have arrived in Austin, but we think the, um, “tans” we worked on yesterday will be worth it! 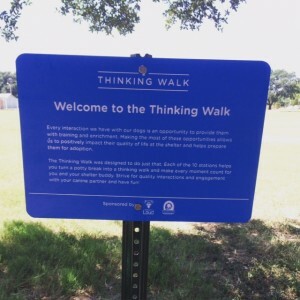 The Thinking Walk consists of 10 simple activity stations designed to make training and enrichment easy and accessible to all dogs, volunteers, and staff. 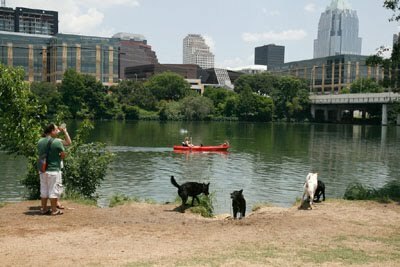 It is set-up along the front courtyard loop of Austin Animal Center, a frequently traveled path for canine bathroom breaks and walks. Volunteers and staff can sneak in a little training during a potty break and not only help work the dogs’ minds, but give them skills to make them more adoptable! You can view and print the full .pdf of the Thinking Walk here (183KB).